Jumeirah Group, the global luxury hotel company and a member of Dubai Holding, recently celebrated the opening of their terrace, an exclusive outdoor leisure experience at Burj Al Arab. Scape Restaurant & Bar offers incredible, never seen before views of Burj Al Arab, the Palm Jumeirah and the city. The innovative, Californian fusion style menu guarantees to surprise and delight guests. While the pool and beach areas are open to members and guests, Scape Restaurant & Bar is open to everyone who wants to enjoy a true masterpiece of innovation. It offers indoor and outdoor seating, is open for lunch and dinner as well as shisha in the outside bar area, making it the ultimate luxurious location to indulge in delectable dishes and drinks. 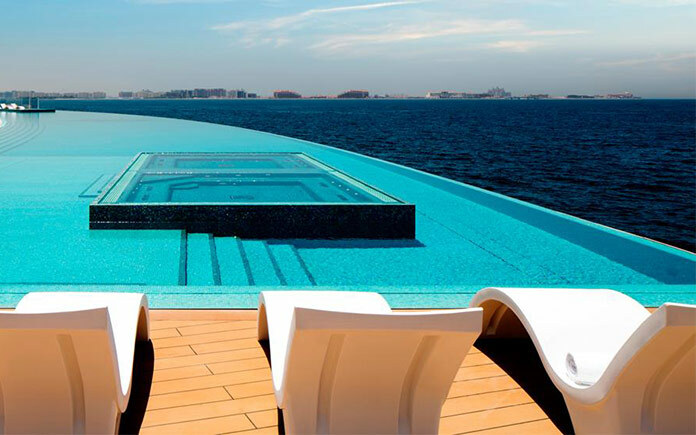 The terrace is a 10,000-square-metre outdoor luxury leisure facility that stretches 100 metres out into the sea. The design also incorporates a 612-square-metre freshwater pool and an 828-square-metre saltwater infinity pool. 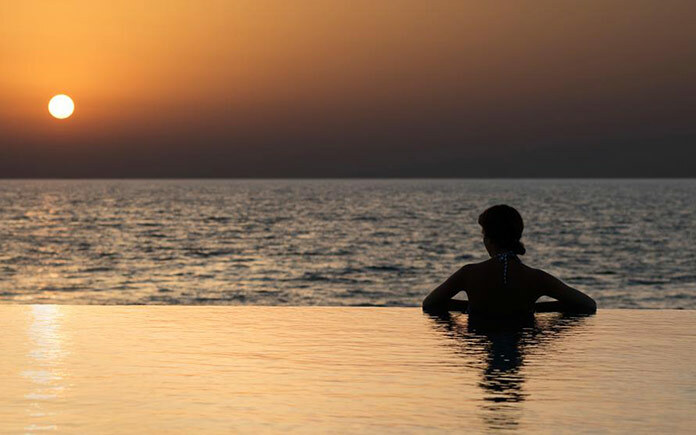 A staggering 10 million mosaic tiles line the pools, while 1,000 tonnes of white sand was used to create the beach. Under the expert supervision of talented head chef Timur Fazilov, formerly of Zuma Dubai and Catch Abu Dhabi, Scape Restaurant & Bar serves up an enchanting menu of Californian fusion style dishes. Signature plates include Hamachi Crudo, with ponzu, pistachio together with citrus zest, shallot rings and olives; Scallop Tiradito with tiger milk, apple and red radish; and Slow Roasted Wagyu Short Ribs with pomelo, candied peanut, Swiss chard and pave potato. The fresh and innovative desserts are guaranteed to get taste buds tingling. Specialties include Chocolate Peanut Pot De Crème and Mascarpone Cheesecake with seasonal fruit compote. 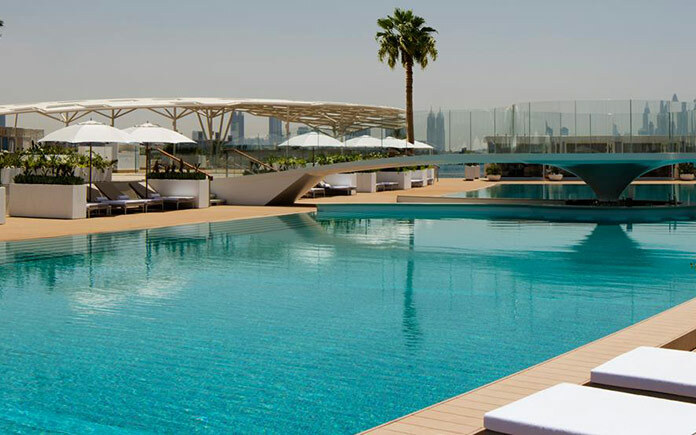 Raising the standards for Dubai’s social scene, the outdoor bar provides guests with a stunning alfresco venue to enjoy drinks from all over the world. Packed with creativity, the expert mixologists at the bar serve a selection of wines, mocktails and extensive range of premium cocktails. 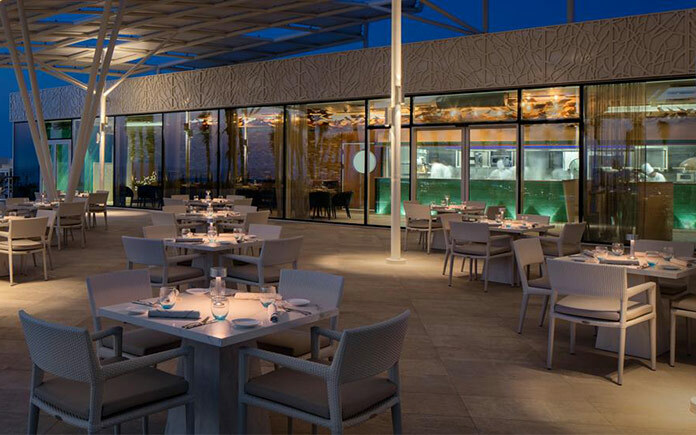 The design of the restaurant mirrors that of the terrace, which creates a fusion of sophisticated, contemporary structures and tranquil stretches of water. Linked by a central walkway, flanked on either side by crystalline beaches and private cabanas, Scape Restaurant & Bar’s outdoor area gives the effect of a stylised tropical forest canopy, with contrasting areas of dappled light and shade. Inside the restaurant a palette of earth tones and clean, sharp whites, highlight the contrasting colours of nature. A handmade, contemporary glass light installation was commissioned to reflect forest leaves. Scape Restaurant & Bar is open for lunch from 12:30pm to 3:30pm, dinner from 6pm to 11pm and Shisha from 12pm. The sharing style dishes start from AED 65. Booking is required for all guests including hotel guests, Burj Al Arab members, and non-hotel guests via Burj Al Arab Restaurants Reservations. Email BAARestaurants@jumeirah.com or call +971 4 301 7600.